Fall is finally here, and this is hands down my favorite time of year. 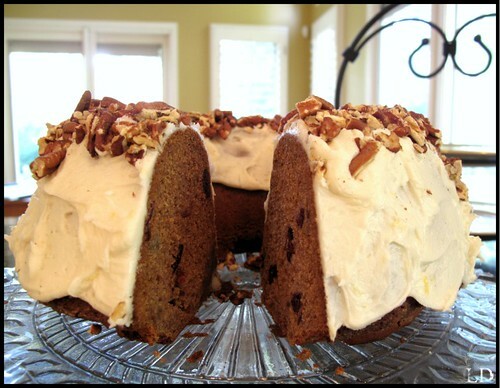 Baking is an essential during this season and I thought I would kick off this season with a yummy spice cake. Preheat oven to 350˙. Lightly spoon flour into a measuring cup level with a knife. Combine flour, baking soda, cinnamon, nutmeg, and salt. Stir dry ingredients with a whisk. Set aside. Eat sugar, and butterfat a medium speed, add applesauce and next three ingredients. Beat well. Add flour mixture, beating until well blended. Stir in craisins. Pour batter into a bunt cake pan coated heavily with grease and dusted with flour. Bake at 350˙for 35 to 40 minutes. 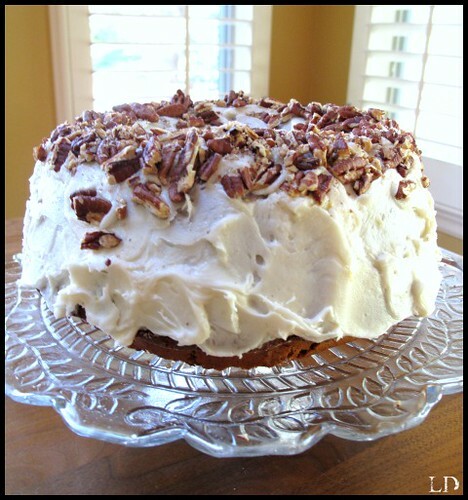 Cool completely on a wire rack, frost with cream cheese frosting and sprinkle the top of cake with toasted pecans. Looks yummy Laura, especially with that cream cheese frosting! Just made another batch of cuppies, and this icing is DELICIOUS! Oh I wish I would have had this a week ago, lol! So easy, and so divine. Yum. Would be good with some almond extract, too. Mmmm... Thanks (as always) for sharing!